Don't you just LOVE counters!? Pens = '本'(books), birds = '羽'(wings), stockings = '足'(feet). Do you know what we're talking about here? Is it how to count different things? We count long, thin objects - like pens - using 本 (hon). we count stockings and shoes with 足 (soku). Counting words such as 本, 羽 and 足 are called "助数詞" (josuushi) in Japanese. 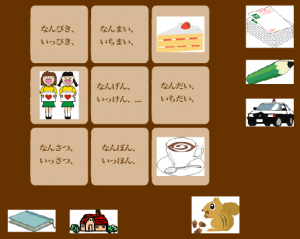 There are various counter suffixes in the Japanese language. There are probably lots of students of Japanese who think "it's such a task to remember them all!". On the other hand, there are probably some students who think " I want to know more!". Here we'd like to introduce some useful websites both for those who love counters AND those who find them difficult. and who want to practice them. The site display is in English. At top screen there is a tag marked 'Counters'. 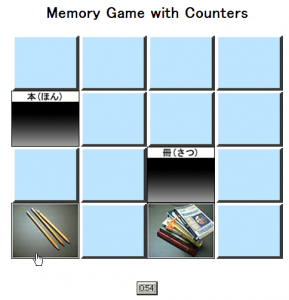 Click here and you'll find lists of counter suffixes, plus games. One of these is split into categories such as ' Animals' or 'Things'. 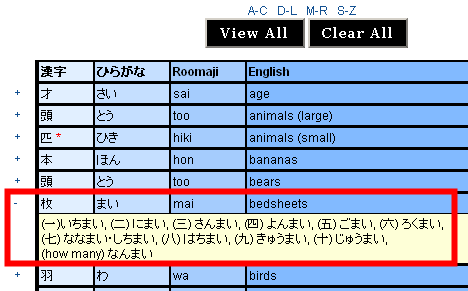 The other list has the English words for objects arranged in alphabetical order. Click on the '+' sign to see how the counter is read with each number, and for example sentences. There are also 2 types of game. For both, you have to match the photo or picture to the correct counter. Next, here is a website where you can look up the counter for something from the name of the object. This is part of the contents of みんなの知識　ちょっと便利帳 (Common knowledge - a convenient guide). The site display is all in Japanese. There are 2 ways to look things up. One of these is to enter the name of the thing you want to count into the search box. For example, let's look up how to count tyres/tires - "タイヤ" in Japanese. Do you know the correct counter? 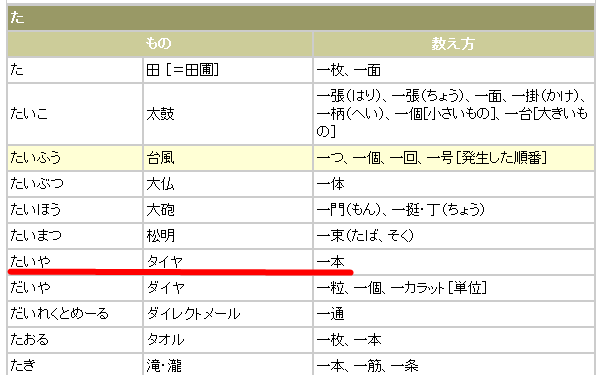 Um... isn't it Ikko(1こ）, Niko（2こ）...? 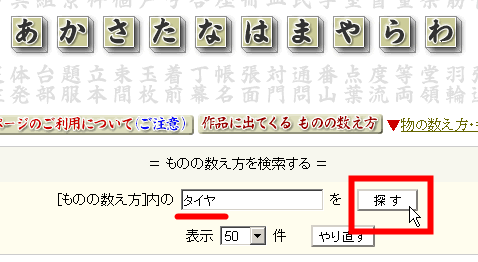 Enter the word "タイヤ" into the box in the middle, then click on '探す' (Search). If you enter the word in hiragana it works too. 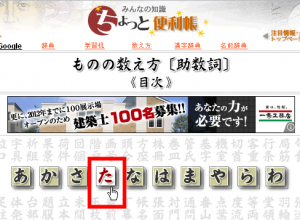 The counter used is "一本 (ippon)". 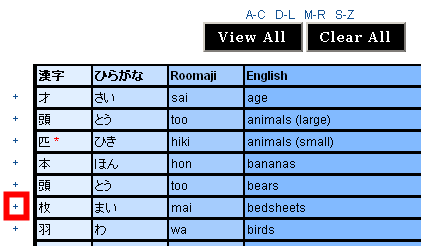 You can also look words up from a hiragana list. 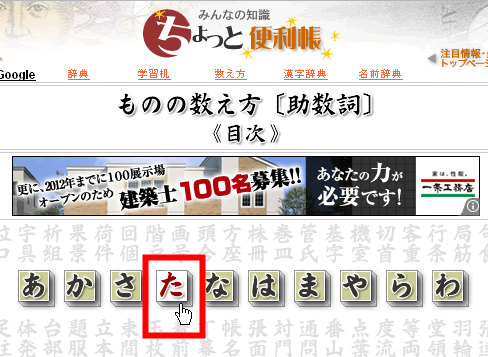 For example, if you wanted to look up "タイヤ"(taiya), you would click on the 'た'(ta) button. "タイヤ"(taiya) can be found 7th from the top. lets you look up various counters via categories. 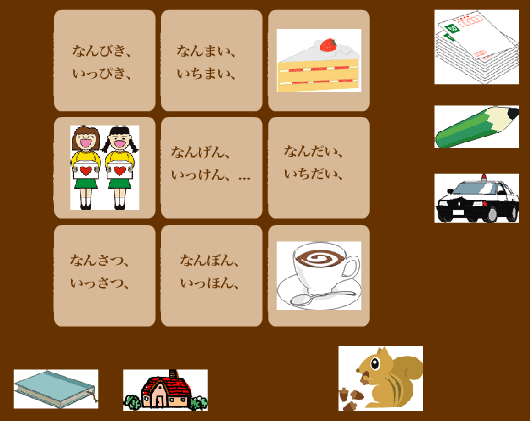 This is one of the contents of the Sanseido Web Dictionary （Introduction article）. The display language is Japanese only. You can look up counters from 10 different categories, including '器具・道具 (Tools & Utensils)', '飲食 (Food & Drink) and '服飾 (Clothes and Accessories)'. As an example, let's try looking up counters for '生け花 (Ikebana - flower arrangements)'. Ikebana would come under culture as a category, so we'll click on '文化・スポーツ (Culture & Sports)'. We can see that ikebana flower arrangements are counted like this: 一杯 (ippai), 二杯 (nihai) etc. There are lots of different ways to count things, aren't there! 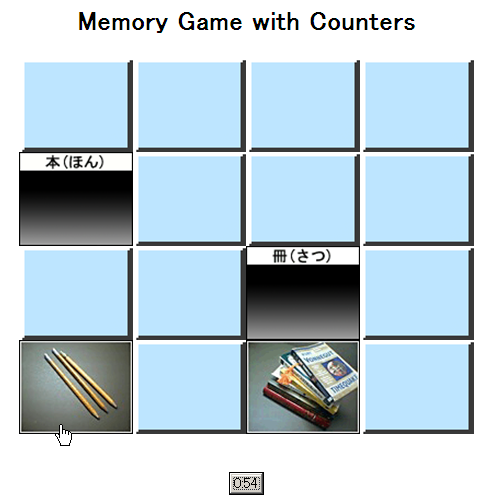 Actually, on the 2nd and 3rd websites we introduced here you'll find plenty of counters that even Japanese people don't know. However, it's interesting to consider why each way of counting was chosen in the first place. For example, for a round object like a tyre, why do we use a counter like '本', that's supposed to be for long, thin objects?